" ... gonna have an Oscar sittin' next to my Grammys ... "
That's a direct quote, from the song "Y'All Know" off of Will Smith's first release under that name, "Big Willie Style." No, you didn't click the wrong link. This is not the music review. One-half of that quote is accurate. Smith is virtually a lock to be nominated for the Best Rap Album Grammy every year he releases a CD. His success on the big screen, however, has been more financial than critical. He's done the action films ("Bad Boys," "Enemy of the State") and the sci-fi films ("Men In Black") and the movies that combine the two ("Independence Day," "Wild Wild West"), and while all of them have been huge successes at the box office, the reviews have ranged from average to downright pathetic. Smith tries drama this time, in "The Legend Of Bagger Vance." This movie has a lot of basic problems. First off, the actors, while performing relatively well, are placed in the wrong roles. Smith's co-star Matt Damon (an Oscar winner in "Good Will Hunting," though not for acting) played a South Boston misguided genius a lot better than he plays a jaded war veteran. Smith is far too young to be believable in his role as the "life is like a box of chocolates" mentor, and Charlize Theron ("Reindeer Games," "Mighty Joe Young") really doesn't speak Southern very well. There a few bright spots though--the cameo from the legendary Jack Lemmon ("Grumpy Old Men," "The Odd Couple") is priceless, and Lane Smith (TV's "The Adventures of Lois and Clark) is good as a reporter who comes to Georgia to watch Matt Damon play golf. has more loose ends than a supermodel who hasn't dried her hair in about a year. And maybe the most annoying thing about the movie was the complete disconnection between the movie and the time in which it was set. 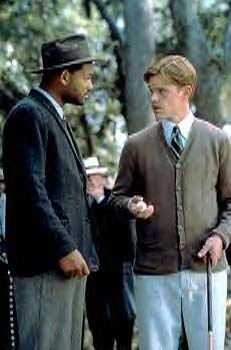 The movie is set in 1930's Georgia; yet Bagger Vance, played by one of the blackest men in the world, is only berated by the white folks when he tries to leave the golf tournament. He's sitting in the white locker room, and no one says anything. Yeah, right. Another thing along the same lines is that during the golf tournament, plenty of black people can be seen among the spectators--probably not something that would have happened in Savannah in the 30s. All in all, this is a movie with a weak plot that is well-acted--by the wrong actors. It's the best performance by Will Smith in a long time, but it's nothing to spend $7 for. Your best bet is to wait for the video--and when you go to Blockbuster to get it, swing by Blockbuster Music and pick up a copy of something that Will Smith will win an award for.